Ai Weiwei, Sunflower Seeds, 2010, porcelain, dimensions variable. Installation view. 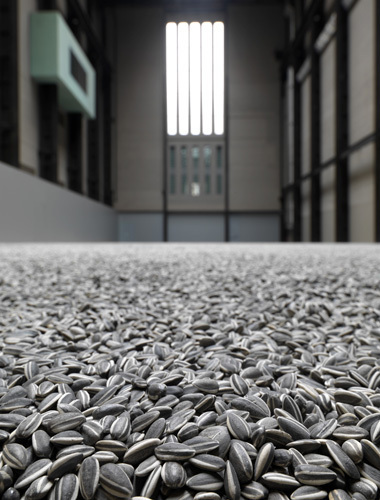 “Why?” a girl asked petulantly at Tate Modern, when she was prevented from walking across Ai Weiwei’s vast offering of tiny things: Sunflower Seeds, 2010, an installation comprising one hundred million handcrafted porcelain sunflower-seed husks carpeting the Turbine Hall. Though the installation has been cordoned off for “health and safety” reasons, visitors can still see the gray-black husks from up close––across a barrier. Ai is no stranger to brushes with authority and bureaucratic control. He was arrested in Beijing in early April as part of the Chinese government’s crackdown on intellectual dissidents and his whereabouts continue to remain frighteningly mysterious. For Ai, sunflowers harbor an ambiguous symbolism. During the Cultural Revolution, Mao Zedong was depicted in posters as the sun, surrounded by little sunflowers meant to represent his “loyal” subjects. Ironically, Ai explains in an accompanying video, sunflower seeds, as a popular street food, remind him of how people pulled together in those dark days. He discloses that the minute artifacts were handmade at Jingdezhen, a city once famed for its exquisite Imperial porcelain, lovingly fashioned by workers who did not comprehend the seeds’ ultimate purpose but who were—as we learn from the video—overjoyed to be making a living again. It appears that one paradigm of authority has replaced another: Totalitarianism has given way to commerce. Although, as Ai’s recent arrest and disappearance evince, the former continues to rear its sinister head now and again to play havoc with civil liberty. So where does the installation’s audience fit in? The artwork invites viewers to speculate on the threat power poses to individuality. However, the two different vantage points—the intimate one of the exhibition’s early days and the more distanced one now available—have yielded entirely different conclusions: When viewers were given direct access to Ai’s installation, each seed husk seemed absolutely unique and seemingly indestructible. (I confess to having jumped on them to see if they would break: They didn’t.) On the other hand, surveyed from the bridge overlooking them, the seeds are indistinguishable from each other, merging together in a sea of gray.